Wild Rubies is a Bally Wulff developed slot machine. As the title of the game shows, the slot machine is all about rubies that are wild. Players will get to enjoy a classic themed video slot, which resembles the fruit machines that players used to enjoy at land based casinos and pubs. Although the game has a classic theme, it has an advanced game play with 5 reels and a special icon. The game can be played right here for free so players can check out what the game has to offer, before they can start placing real money bets on the slot at the online casinos that host the game. Wild Rubies by Bally Wulff is a 5 reel game that has a classic fruit theme. This reel set is home to 10 wager lines through which players can claim plenty of line prizes when they get matching symbols on these lines. Players will have to get 3 matching symbols on the same line from the left to the right. The different payouts that the players can claim are all listed in the paytable of the game. Players can open that paytable by clicking on the button on the far left of the control panel of the game. Players will also place their stakes at this control panel under the reels before they would start the game play. They can spin the reels once through the spin button, or through the auto play function. 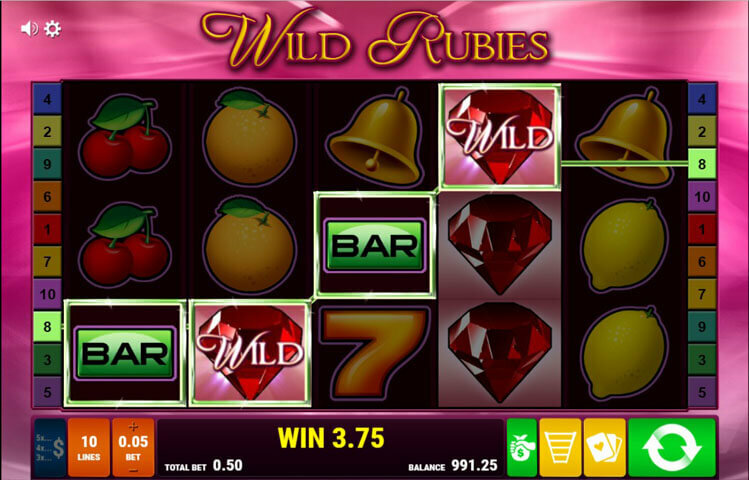 Wild Rubies has a fruit theme, which is inspired by the classic fruit machines and slots. This is why the symbols that will appear across the reels of the game include bar icons, oranges, lemons, watermelons, plums, cherries and more. There is also the special icon of the game, which is the Wild Rubies symbol. All of the icons come in cartoonish styled visuals. The game is entitled Wild Rubies, which is why the special wild icon of the game is none other than the Wild Rubies symbol. This symbol will help players greatly in achieving a winning combo. It will do that by replacing any of the other symbols appearing anywhere across the reels and the lines of the game. It will replace the symbol that is going to result in the creation of the best paying combination of symbols, depending on the other symbols on the lines. The wild icon is also the highest paying symbol, as players getting from 3 to 5 of these icons would claim a generous line prize. So this symbol is not only wild, as it can give great prizes when matched as well.